My copy of Firearms: A Global History to 1700 by Kenneth Chase has just arrived. Cracking it open near the middle, I landed on the section concerning Guns and Bows. Thankfully, Chase doesn’t repeat the line, common in history books written for a casual audience, that firearms were somehow less effective than bows until the American Civil War. 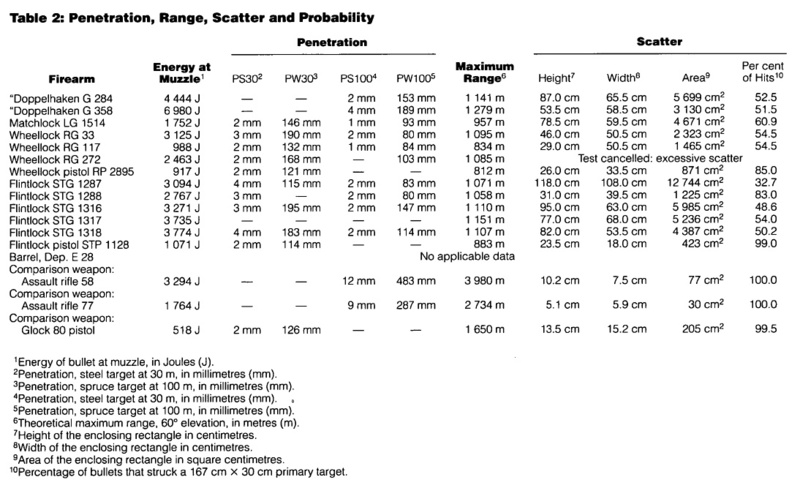 Chase does, however, compare bows and firearms in terms of reliability, rate of shot, and accuracy. Chase claims that firearms misfired up to 50% of the time, citing Tallett, War and society in early-modern Europe, p. 23. This assertion is extremely dubious. Nobody would use a weapon that was so unreliable. In a test at the Provincial Armory in Graz, Austria, the muskets were tested at a range of 100 meters (109 yards) against a target 167cm x 30cm, or about the height and width of a short man with no arms. The pistols were tested at 30 meters. The muskets had significantly more than “no chance” of hitting at 100m. I suspect that period firearms might have even performed better than the results of the Graz test indicate. Three of the muzzleloaders tested were rifled: G 284, RG 272, and STG 1288. Only STG 1288 displayed better accuracy than the smoothbores- but STG 1288 was also the only muzzleloader loaded with a bullet larger than the bore. The report does not mention what sort of wadding or patch was used, if any. Lack of a patch would explain why the rifles provided with sub-caliber bullets didn’t perform better than the smoothbores, as the bullet could not engage the rifling. If the test was really performed without wadding or patch, that is an unfortunate oversight. Also consider, that at the time the Graz tests were performed, the weapons are hundreds of years old. While when the weapons were actually in use on the battlefield, they would have been relatively new. The test writeup mentions that two pieces were rejected because of weakness in the metal. If two pieces had become too dangerous to shoot in the years since they were built, then time, moisture and the notorious corrosivity of black powder residue could have also worn the pieces enough to negatively affect accuracy. This post deals only with theoretical accuracy against man-sized targets. Tests against targets the size of close-order units, and accuracy under real combat conditions, are another matter.